To receive email from NC Farm to Preschool Network, add kim+asapconnections.org@mnb.email to your safe sender list. The purpose of the NC Farm to Preschool Network (NCF2PSN) is to connect, educate, develop, and share resources between community and state partners, farmers, early childhood educators, and families to spark the local foods movement in early childhood education environments. August can be a time of abundance in North Carolina gardens! If you planted in April and May, have had good rain (or made sure to water when you did not), and if you managed to keep the insects and animals away, you should be buried in all kinds of wonderful summer veggies about now! Tomatoes, beans, squash, cucumbers, eggplants, and peppers should be plump and ready for picking. Enjoy the harvest for as long as the plants are producing and looking healthy. Picking before vegetables get too large or overripe will help keep the plants producing longer. August is also a time when summer vegetables may start to slow down or look tired as a result of so many hot days, not enough rain, and insect infestations. If veggies are left on too long, they will get tough or may be bitter and start to make seed. Then, the plant will think its work is done and start to die. When plants start to decline, it’s time to pull them up and make way for your fall garden. Beginning in August in NC (and even July in the western and Piedmont parts of the state), we can start to plant cool season crops again for a fall and winter harvest. Root crops like carrots and beets can go in first, then mid to late August and early September you can put in seeds of lettuce, spinach, collards, and kale and watch for plants at your local nursery of broccoli, cauliflower and cabbage. Fall is also a good time to try some cool season herbs like cilantro, parsley, and dill. For flowers, pansies are great to plant in fall as they will grow right through the winter and into the spring. Here is a great article on fall gardening from the Sow True Seed in Asheville. 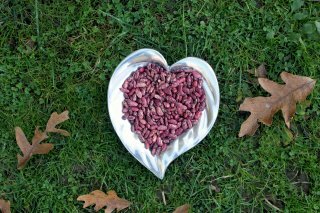 You can also request their FREE seed catalog and planting guide. Be sure to consult a planting guide to insure you are planting at the right time for your area of the state. An excellent resource for central NC can be found here. Or, consult with your local office of the NC Cooperative Extension Service. Fall is a wonderful time for gardening, there are fewer pests and weeds, not as much need to water and plants live longer and actually taste sweeter as the temperatures cool down. 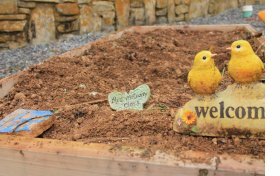 If you have not done so already, be sure to check out the excellent childcare center production garden series created by NLI with CEFS and Cooperative Extension. They include planting tips for spring, summer and fall as well as cooking ideas for warm and cool season crops. For Kids Garden Month in April, KidsGardening.org asked kids to DREAM BIG and tell them about the garden of their dreams using words, artwork, song, or media. They asked them what grows in their dream gardens, who visits, and why they love it. 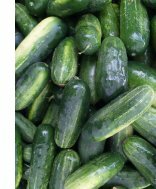 August you'll find cucumbers in full swing in gardens and farmers markets. 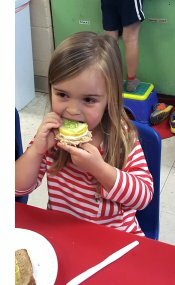 Check out this Cucumber Stack Lesson and Recipe where children learn how to make their own snack and through a hands on cooking experience gain motivation to try a new vegetable. Children learn about kitchen utensils and how to use them to make a specific recipe. pieces and set aside. Lay the bread slices onto sheet trays. Choose a cookie cutter and make a fun shape out of bread.Spread about a tablespoon of cream cheese on top of the slice of bread. Put pieces of cucumber, pepper, or carrot on top. Enjoy! For the full lesson plan, visit growing-minds.org. Incorporating indigenous foods into education and meals in early care and education (ECE) settings offers many benefits, including increasing children’s knowledge of tribal history and food ways and strengthening cultural, spiritual, and social connections in the community. However, ensuring indigenous foods are procured, prepared, and served in ways that align with state licensing and Child and Adult Care Food Program regulations can be challenging. 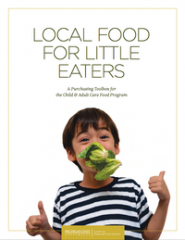 Join this webinar to hear from speakers from the National Farm to School Network, the Institute for Agriculture Trade and Policy, and the Aleutian Pribilof Islands Association and to learn about innovative practices and resources that help overcome these challenges and support the inclusion of indigenous foods in ECE settings and in CACFP. Typically 4th Wednesday of the month. To be added to listserve, email eceobesity@cdc.gov. Healthy Eating in Practice is a conference focused on changing the culture of healthcare to better support healthy eating behaviors and prevent chronic diet-related diseases in children and families. Register at healthyeatinginpractice.org. Special rates are available for nurses, nurse practitioners, physician assistants, and dietitian/nutritionists. 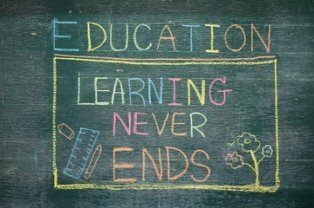 Continuing education credits are available for some healthcare professionals. Growing Minds offers two funding opportunities for pre-K through 12th grade teachers and members of the public working in cooperation with a school in ASAP’s Appalachian Grown Region. This is a great book for young children that not only highlights the bounty of the summer garden with colorful illustrations but also includes lots of prepositions which are an important concept we are teaching in early childhood classrooms. 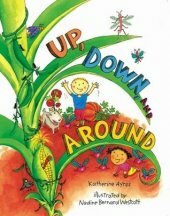 Use this book to enhance literacy as you learn about vegetables in the garden and whether they grow up, down, or around. 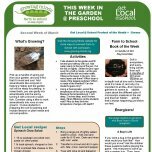 See what's happening This Week in the Garden for preschool! As we enjoy the summer harvest of NC fruits and vegetables, it’s a perfect time to plan ahead for Farm to School Month. Across the state, kids and adults will be crunching into locally grown apples on October 10 for Farm to School Month. The NC Crunch, from the Farm to School Coalition of NC, is designed to celebrate agriculture, nutrition, and farm to school/ECE. To sign up for the NC Crunch and receive an event guide, go to http://growing-minds.org/north-carolina-crunch. Caroline served four years with FoodCorps North Carolina implementing farm to school programs for K-12 environments. Now with the NC Farm to Early Care and Education Initiative, she works with ECE programs, technical assistance providers, community leaders, and food systems folks across the state to advance their goals for improving food systems and the health of young children through collaboration. Exciting things are happening behind the scenes with the Network to make connecting with farm to preschool enthusiasts across the state easier. Stay tuned this fall! Like us on Facebook for the most up to date information on resources, events, webinars, and more!